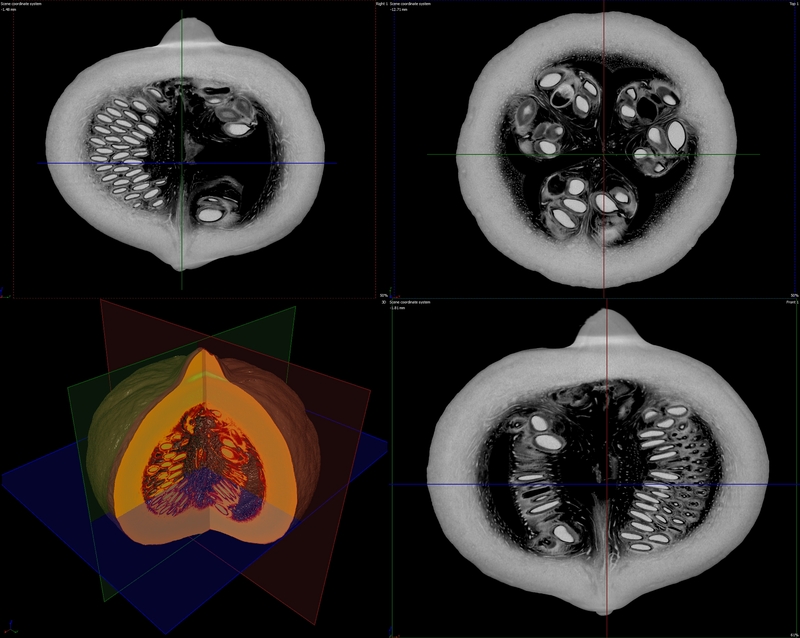 This top to bottom scan created by Sergei Kolobov at Nikon Metrology reveals the inside of the office pumpkin. You can see seed clusters as well as the individual seeds as the video flies through the pumpkin. CT slices reveal the seeds inside of the pumpkin. X-rays aren’t strictly limited to skeletons (or pumpkins…), with Nikon Metrology’s CT contract inspection services, anything that requires CT analysis can be scanned at a local Nikon Metrology inspection facility. Find which inspection centre is closest to you, here. Computed Tomography (CT) is the answer to the question: how do you know what is inside of something, without destroying it? Although pumpkins are relatively inexpensive and produced with the sole purpose of being destroyed, this pumpkin perfectly demonstrates what Nikon CT offers. 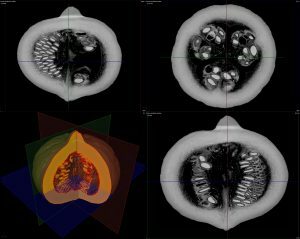 These fascinating Halloween themed scans, created by Sergei Kolobov, X-ray and CT Engineer at Nikon Metrology illustrate how CT technology can be applied to great effect, in almost any application. With a legacy of more than 30 years in X-ray and CT, Nikon Metrology has extensive experience and knowledge which is offered to clients in the form of inspection consultancy services. Nikon CT experts and specialists work with clients to completely understand the problem before scanning the object. Using the state-of-the-art, internally designed, developed and manufactured micro-focus X-ray CT systems, you will get the inside picture by looking into the internal structure without destroying the object. Nikon’s fast acquisition and reconstruction software will give you the inside insight and CT experts will analyse and provide consultancy on the results. Learn more about Nikon Metrology’s X-ray and CT systems here. Elbflorace uses Nikon Metrology CT for designing and producing electric vehicles, read the full story here.